Originally published on November 30, 2018 by BNP Media through the Building Enclosure Blog. In their latest Infrastructure Report Card, the American Society of Civil Engineers (ASCE) gave our domestic wastewater infrastructure and average grade of D+ citing 772 communities in the US in which wastewater and stormwater drain into the same treatment system. These combined sewer systems can experience capacity issues following heavy rain events, resulting in overflows containing a combination of stormwater with untreated human and industrial waste, toxic substances, debris, and other pollutants. Termed “combined sewer overflows” (CSOs), these events can significantly impair water quality and affect public health and wildlife. In the Great Lakes region alone, a 2016 EPA report to the US Congress identified 184 communities that discharge CSOs into the Great Lakes Basin. The report cited 1,482 CSO events in 2014, discharging an estimated 22 billion gallons of untreated wastewater into the Great Lakes Basin. These strategies come with varying degrees of effectiveness but together they constitute a formidable solution to strive toward zero overflows. Milwaukee and other cities have long considered green infrastructure as a primary solution toward realizing effective stormwater management. However, the biggest contributor to overflow events when a deep tunnel infrastructure is present are acute, heavy rain events where the volume overcomes the conveyance capacity of the deep tunnel system. The solution: the rainwater during these events must be temporarily slowed down. I’ll offer that there is one strategy particularly well-suited to help stem the tide of stormwater overflow during an acute, heavy precipitation events: blue roofs with smart drains – or smart blue roofs. In order to truly achieve zero overflow events, it is critical that we reconcpeutalize our roofscapes with regard to their role in stormwater management – and it is not as difficult to achieve as you might think. Blue roofs are membrane assemblies on low-sloped roofs. These roofs are designed to hold pools of water for a period of time not-to-exceed 48-hours, with depths (which are commonly greater than 6-inches) varying greatly based on the structural capacity of the building below. Blue roofs weigh up to 80% less than green roofs. The temporary load of the blue roof is already accounted for by codified structural requirements in colder climates (due to the factored-in snow load). Blue roofs require minimal site modifications. You just need a really good roofing membrane and installer and then add smart drains (i.e. drains with electronically automated drainage valves). 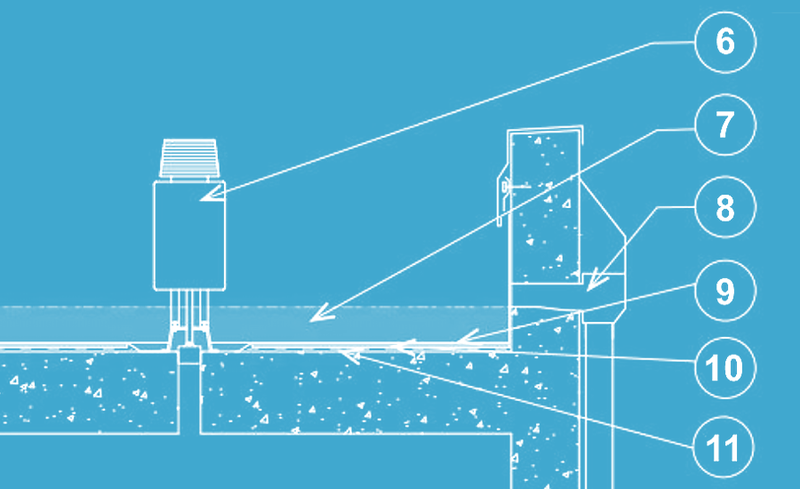 Amid our internet-of-things era, why not have the roof drains tied in? 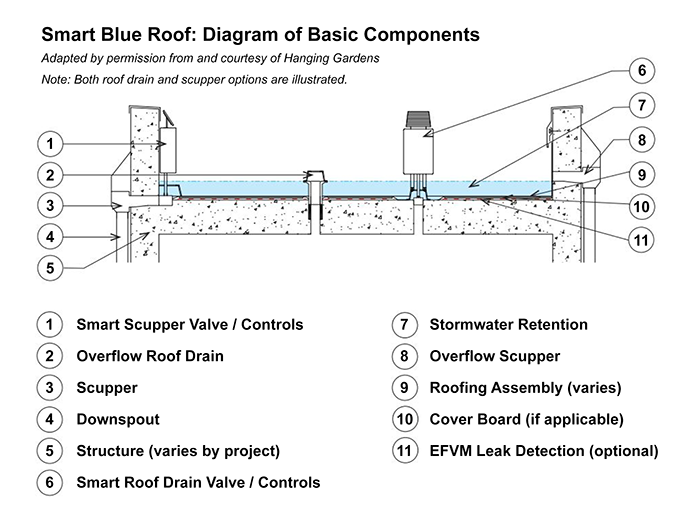 Smart blue roofs (i.e. blue roofs with smart drains) tie into a remote server that determines when a storm event is coming. The server will in turn instruct the rooftop drain valves to close via cellular communication. The closed valves will turn the roof is a shallow retention pond. Rainwater is held throughout the duration of the storm as the server determines when water should be released into the stormwater drains. When the timing is right, the valves are opened and water is released into the drains. The valves are programmed to automatically release water if it has been held for more than 24-hours without communication from the server. To be clear, I am not advocating for blue roofs in lieu of green roofs. Due to the various additional human health and environmental benefits offered, green roofs are superior to blue roofs. However, smart blue roofs can cost 75 to 90% less than green roof systems. When a green roof is not an option financially, a blue roof should still be within grasp. Whether green or blue, a city’s low-sloped roof real estate offers an enormous opportunity to blunt the strain on wastewater infrastructural capacity experienced during acute, heavy rainfall events. Our roofscapes will play a critical role in any comprehensive municipal strategy to achieve zero overflow events.